Cardigan Bay Active01239 612133work Outdoor Pursuits CentreCardigan Bay Active is an outdoor Adventure Activities Provider which delivers a wide range of outdoor activities using a variety of specialist activity providers. We pride ourselves in delivering a range of activities for you, your family and friends to enjoy the best of what our local landscape has to offer. We provide one of the region’s largest choice of activities on the sea, on the river and on the land from our base on the Afon Teifi and out into cardigan bay and around the Ceredigion and Pembrokeshire coast. Most of our activities are able to book as an introduction (2-3 hours) or up to a full day. We’ve tailored some activities for children, some for activities adults and other activities for the family. We are careful to use locally knowledgeable instructors for our activities, top quality equipment and adhere to the best safe working practices so you can get on and enjoy your adventure with us. Most of the work we do is for families, and being a family run adventure company we understand that quality time together is precious. we pride ourselves in offering the safest of environments for your family to enjoy a new activity together, to relax and have fun. Cardigan Bay Active is an outdoor Adventure Activities Provider which delivers a wide range of outdoor activities using a variety of specialist activity providers. Our activity programme is designed to offer you a wide choice, so if you do want to split up and do your own thing you can. 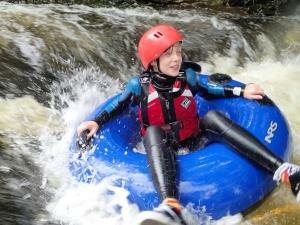 No previous experience is required and some activities require a parent or guardian present but most of our activities are licensed by the Adventure Activities Licensing Service (AALS) for the provision of adventurous activities to unaccompanied under 18 year olds.